The 12th annual Stevie® Awards for Women in Business, the world’s top honors for women entrepreneurs, executives, employees, and the organizations they run, will be presented on Friday, November 13 at the Marriott Marquis Hotel in New York City. More than 400 nominated women and their guests from around the world will attend. The awards will be broadcast live via Livestream at 7:30 pm ET via the Stevie Awards’ Facebook page. On your mobile device, watch the awards presentations on the Stevie Awards for Women in Business website. The pre-show from the red carpet will air live from 6:00 – 6:30 pm ET on the Stevie Awards’ Periscope. Follow “TheStevieAwards” on Periscope to tune in. The pre-show will feature interviews with Stevie Award Finalists from around the world. 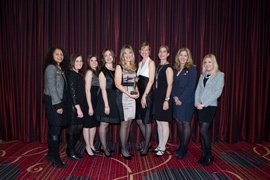 More than 1,400 entries were submitted to the Stevie Awards for Women in Business this year by organizations and individuals around the world in more than 90 categories including Executive of the Year, Entrepreneur of the Year, Startup of the Year, Women Helping Women, and Women-Run Workplace of the Year. Among the leading contenders this year with five or more Finalists are Accenture, Chicago, IL; AT&T, Dallas, TX; Collectively, San Francisco, CA; DHL Express Worldwide; Digital Air Strike, Scottsdale, AZ; Digital Risk, Orlando, FL; iFinance Canada Inc., Toronto, Canada; Jacobson Strategic Communications, Philadelphia, PA; LLORENTE & CUENCA, Madrid, Spain; Ooredoo, Doha, Qatar; Pink Elephant, Burlington, ON, Canada; Red Hat, Raleigh, NC; Roshan, Kabul, Afghanistan; and Synchrony Financial, Stamford, CT.
For a complete list of Finalists by category, visit http://www.StevieAwards.com/Women.